In the Content Manager you have the ability to see your content in either list format or in the Calendar View. This can be accessed in Content Manager > Approved > Calendar Symbol. 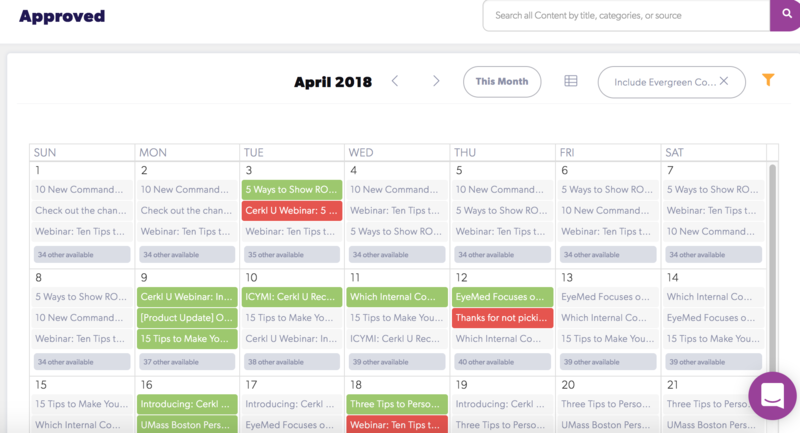 The Calendar View allows you to quickly identify content by it's publish date (highlighted in green) or it's expiration date (highlighted in red). This view also allows you to see ALL available content from a given day. This means that you can check your calendar for days where your content is dangerously low and unable to fill a newsletter for certain subscribers in your audience. By clicking into your 'Other Available' stories you can quickly see the types of stories as well as previews of the content. We are excited for this view to help visualize what Cerkl's AI has the power to choose from on any given day. Look at the your list of available stories today and know that Cerkl will pick up to 9 stories from that list for each individual newsletter and send them out to all of your subscribers at their given time without you having to lift a finger.